Status and wealth. Doing business. Stubbornness. Holding on to what you know. Penny smart, but Pound foolish. The crown symbolises status. There is a coin underneath each of the man’s feet, symbolising earthly possessions. He holds a coin in his arm folded in the infinity symbol, symbolising flow of abundance. One coin is on top of his crown symbolising mastery and authority in the material world. His clothing is red with a blue trim symbolising passion and contemplation combined. The man is sitting on a cubic stone symbolising stability and perfection. In the background is a city symbolising opportunities. The man is sitting above it on what looks like a stage, symbolising the man has high social status. Four of Pentacles tarot card denotes the need for security and recognition in your life. This card shows financial stability and having made a solid foundation due to career advancement and rising to the top in career and business. Just make sure you don’t take a defensive stance where you are too careful to move forward in case you will lose your comfortable position. This card shows stubbornness in the situation or in the Seeker. The Seeker needs to have control and see their money increasing. Four of pentacles tarot card often shows up when you have been nurturing something that later ends up turning against you in some way. Tips when Four of Pentacles shows up in a reading: Four of Pentacles speaks of your relationship with money. How far are you willing to go for money? Help your clients find ways of feeling secure. When this card shows up the clients will often act as if they are poor when they, in fact, have plenty. In a love reading, Four of Pentacles tarot card speaks of money being an important factor in the relationship. Money might be the main motivation to stay in the relationship. If the Seeker is single Four of pentacles can indicate fears of giving and sharing keeping the Seeker single. The Seeker might be only interested in a potential partner if they are very wealthy. In a career reading, Four of pentacles speaks of contracts involving big money. 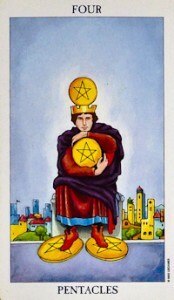 Four of pentacles also denote careers in well-established firms. Four of pentacles as feelings can mean the Seeker loves material comfort and they need to feel secure. It is possible, they are not feeling very secure and are looking into how they can safeguard themselves and their assets. If you are asking how someone is feeling about you, Four of pentacles can mean this person is feeling protective of themselves. They could have a lot to lose in a personal relationship and are not going to open up quickly. It could take this person a while before they fall in love. Learn what Four of Pentacles tarot card means in the Grand Tableau. Four of pentacles tarot card is someone who is very well-connected and is always hungry for more success and wealth. Four of pentacles tarot people are very stubborn and don’t let go of their position easily. They rarely take advice from others and therefore go through many hard life lessons, especially in their personal life. This is someone who is resisting change and are limited by their own control issues. Four of Pentacles reversed indicates a lack of something solid and dependable. There is nothing really reliable to hold on to. The seeker might be foolish with their money. There is meanness with money, business problems and poor self-esteem seen in Four of pentacles reversed. 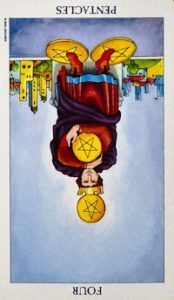 Four of pentacles tarot card reversed often shows up when the Seeker is penny smart but pound foolish. Four of pentacles reversed indicates someone who is holding onto material accomplishments out of fear of failure and abandonment. They often lose their financial security due to their lack of generosity, and they become greedy and needy as a result. They believe money is the answer to all problems and measure their worth against how much is in their bank account. This is someone who tries to impress others by pretending to be much more successful than what they really are. Four of pentacles reversed people tend to lose track of what is really important in life. 4 of pentacles + The Fool: New money. A new investment. A rich kid. Born rich. 4of pentacles + The Magician: Successful sale. 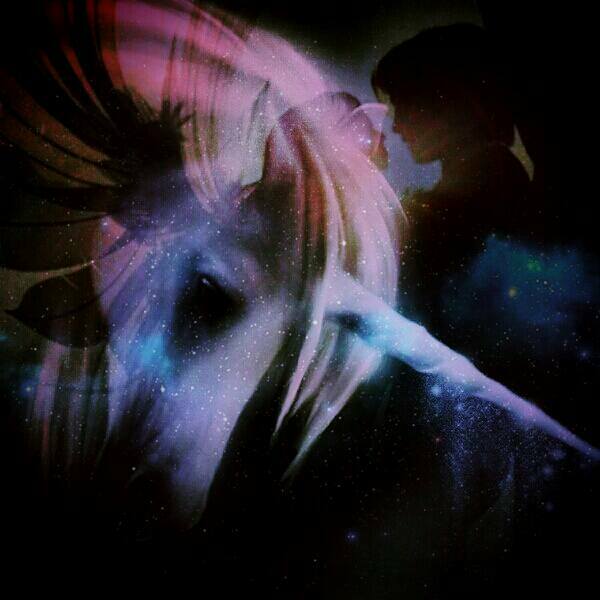 Getting more than you thought. 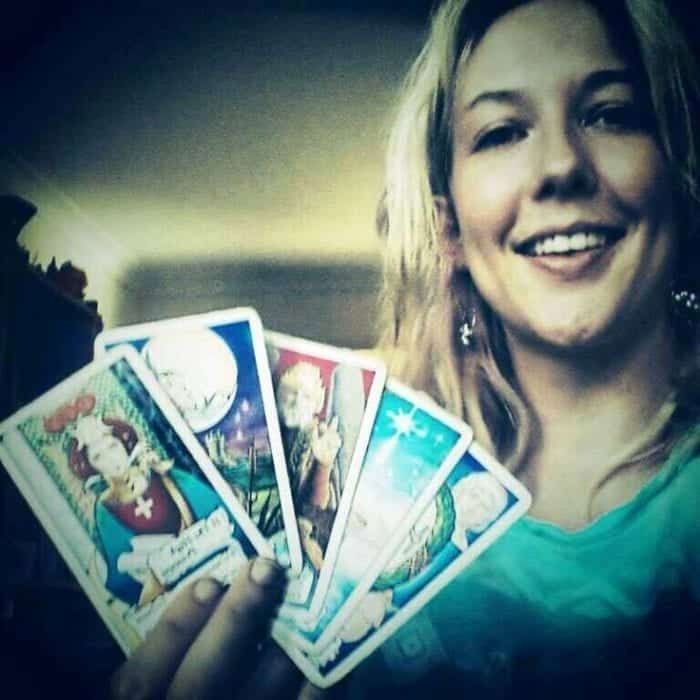 4 of pentacles + The High Priestess: Secret investment. Businesswoman. 4 of pentacles + The Emperor: Government money. Businessman. 4 of pentacles + The Hierophant: Private schools. Financial institutions. 4 of pentacles + Strength: Passionate about business and investment. Compassionate with money. 4 of pentacles + The Hermit: A wealthy benefactor. 4 of pentacles + Justice: Protecting your assets. Compensation. Business law. 4 of pentacles + Temperance: Business management. 4 of pentacles + The Devil: Dirty money. 4 of pentacles + The Tower: Fighting about money. 4 of pentacles + Ace of wands: A new financial opportunity. 4 of pentacles + Two of wands: Business negotiation. Financial planning. 4 of pentacles + Eight of wands: Business travel. Business news. 4 of pentacles + Nine of wands: Pressure in business. Pressure to perform in business. 4 of pentacles + Page of wands: Early stages in business. 4 of pentacles + King of wands: Business leader. 4 of pentacles + Ace of cups: Loving your business. 4 of pentacles + Three of cups: Wealthy friends. 4 of pentacles + Five of cups: Financial disappointments. 4 of pentacles + Ten of cups: Spiritual entrepreneurship. 4 of pentacles + Knight of cups: Travelling up the business and social ladder. 4 of pentacles + Ace of swords: Cuts in business. 4 of pentacles + Two of swords: Business contract. 4 of pentacles + Five of swords: Financial betrayal. 4 of pentacles + Knight of swords: Competition in business. 4 of pentacles + Ace of pentacles: New wealth. 4 of pentacles + Five of pentacles: Financial loss. 4 of pentacles + Ten of pentacles: Family money. Four of pentacles is a tarot card that speaks of wealth on the material plane, rather than a spiritual aspect. There is the need to always have more money when Four of pentacles shows up. There is also a need to flaunt and impress with money. Status is of importance. Sometimes this card shows up when the seeker has a fear of being poor, and business and money matters come before friendships and intimacy. Four of pentacles can indicate that the seeker has trust issues, especially if it shows up reversed. 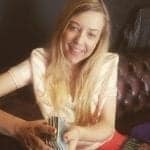 Learn the Meanings of Four of Cups, Four of Wands, and Four of Swords. Learn the Meanings of the number 4 in Numerology here.